Pod- and capsule-based brewing systems are praised for their convenience. But you know what isn’t convenient? Storing dozens of single-serve capsules! 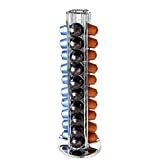 To solve this problem, companies have created all sorts of different Nespresso capsule holders. We scoured the web and found 8 distinct types, all of which have definite pros and cons. What is it? An under-machine capsule storage system. 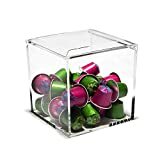 There are a lot of slight variations, but usually capsules are stored in a single drawer, which is easy to access for brewing and refilling. OriginalLine or VertuoLine? There are models for both (shown below). What makes it awesome? Proximity and convenience; you can’t get much closer to the machine than directly under it. What are the drawbacks? Depending on the specific tray you choose it adds 3-4″ of height to the setup, which may or may not work in your kitchen. Also has a larger countertop footprint by square area. Click each image above for more information. What is it? 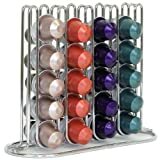 Same theory as The Tray but has multiple drawers and isn’t intended to be stacked under your Nespresso machine. OriginalLine or VertuoLine? Both! Just make sure the model you buy has enough drawer clearance for the capsules you use. What makes it awesome? 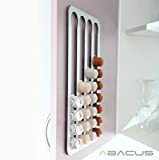 Can hold around the same number of capsules as The Tray but takes up much less square area on your countertop. What are the drawbacks? Unlike The Tray, requires additional countertop space next to your Nespresso machine. What is it? A rotating, vertical storage system. Some have compartments for each capsule, like the version shown on the left below, while others allow you to stack capsules and pull one from the top each time. What makes it awesome? Extremely small footprint, so doesn’t take up much countertop space, and some have huge capsule capacities (80+). 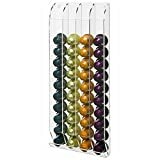 While aesthetics are completely personal preference, I tend to think the skyscraper carousel racks are very visually appealing. What are the drawbacks? Generally require more vertical space. For the ones that allow you to stack capsules (below, everything but the left) you can only take pods off the top. What is it? Stackable capsule storage system mounted out of the way on a wall. Sometimes capsules are dispensed from the bottom (below, left) or from the top (below, right). OriginalLine or VertuoLine? OriginalLine only. What makes it awesome? If you have sufficient wall space, T Wall-Mounted Rack allows you to free up your countertop and drawers. I also happen to think they look pretty cool! What are the drawbacks? Requires you to mount the rack onto the wall, which could mean putting holes in your wall. (You may look into sticky putty or velcro strips.) The capsule capacity also leaves something to be desired with most models. The two versions shown below hold fewer than 40 capsules. What is it? A pretty ingenious device, The Hanging Helper mounts under your cabinet and tucks away when not in use. When you need a capsule just grab the front handle and pull downward to display your stash. Max capacity is 40 capsules, which is pretty standard. What makes it awesome? Zero countertop footprint and tucks away virtually out of sight. What are the drawbacks? Requires you to mount the drawer to the bottom of your cabinet and compatible only with OriginalLine pods. What is it? When I was a kid I used to love Connect Four. You know, that game where you take turns stacking chips trying to get four in a row? 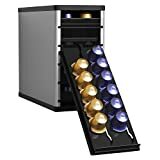 This style of Nespresso capsule holder looks a lot like that childhood game, which gives it a certain nostalgic quality. What makes it awesome? Aside from the inescapable connection to your youth, The Connect Four holder generally tucks out of the way with a small countertop footprint. The two versions below both stack capsules on either side, so they don’t sit directly against the wall but rather neatly in a corner. What are the drawbacks? Requires capsule stacking, so you need to draw them out from the top. Max capacity is around 40 capsules. What is it? It’s a cube! 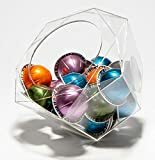 Basically, it’s just a container for storing your Nespresso capsules. What makes it awesome? Simple with no moving parts (that means no breaking). What are the drawbacks? I mean, it’s just a cube. What is it? It’s like The Cube, except it’s The Hexagon. What makes it awesome? Also simple with no moving parts, and it definitely has a more visually intriguing design. I also like how the opening faces towards you. The lazy person in me appreciates the easier reaching motion. What are the drawbacks? The hexagon shape gives it a less sturdy base than The Cube, so it’s more prone to tipping over. I love your website! You are spot-on in your evaluation of the Nespresso coffee lines! I love my pixie, especially because of the 19 bars of pressure used in the extraction! You missed the best and most minimalist one. 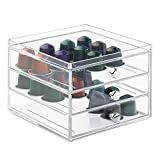 The Avanti Genoa acrylic 36 capsule box. I’ll have to check that one out, thanks for suggesting it! The carousel option you listed for the VertuoLine is actually only for the OriginalLine and does not fit vertuo pods. Did you post the wrong link, or are there no carousel options for VertuoLine?